When two forces meet each other, wins the one that has more discipline. Do you know anyone, that could be more disciplined than a ninja? Spend money on six types of ninjas and protect your land. Centuries ago people were afraid of pirates, but that was not the most terrifying force known to people. Ninjas could kill their target without being seen, using silent weapons. 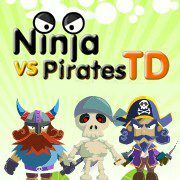 Protect the land of ninjas from the invasion of pirates. Deal with different types of pirates and skeletons by placing six different ninjas along the road.